In two recent cases, the Church of Scientology did condemn the State for “gross fault and denial of justice” and Unadfi for “abuse of the right to engage legal proceedings.” The press did not consider useful to mention to his readers these two convictions. Yet taxpayers would surely be interested to know how the State uses their money. 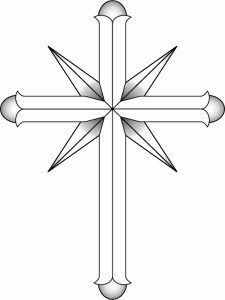 Emblem of the Church of Scientology. In two recent cases, the Church of Scientology did condemn the State for "gross fault and denial of justice" and Unadfi for "abuse of the right to engage legal proceedings." The press did not consider useful to mention to his readers these two convictions. Yet taxpayers would surely be interested to know how the State uses their money. Tuesday, November 24, 2015, the Paris Court of Appeal sentenced the French government for "gross fault and denial of justice" against the spiritual Association of the Church of Scientology-Celebrity Centre (ASES-CC). The Scientology association argued that, in 2009, the prosecution requested the dissolution of the association, this was not only illegal but constituted a "serious misconduct" for which the State should be sentenced. The Paris Court of Appeal ruled in favor of the Church : "The Public Prosecutor who[...] ‘practices public prosecution and requires the application of the law’, is duty-bound, in all circumstances, to master the legislation and to know changes or modifications of the positive right in effect ; that this deficiency characterized prosecution, even if the court, making a correct application of the law, has not pronounced the dissolution of the Spiritual Association of the Church of Scientology Celebrity Centre, characterizes the deficiency of the public service of justice to fulfill the mission entrusted to him. " On the other hand, the court declares the ASES-CC "wrong in his claim for compensation for moral injury and dismisses it". The State already (in January 2014) was convicted for "denial of justice" for violating the right of association and of some of its members to receive justice within a reasonable time, and sentenced to pay € 35,000 to the association and its members. The judgment of 23 November confirms the sentence. 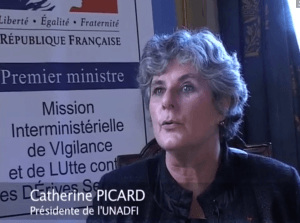 Catherine Picard, President of Unadfi. The previous week, Unadfi Association (National Union for Defense of the Family and the Individual, mainly financed by government funds) was condemned by the Court of appeal of Paris to pay € 21,000 to the ASES-CC for "abuse of rights" for having joined, and persisted unlawfully and in bad faith as a plaintiff against the Church in the same case. In its judgment of 20 November 2015, the Paris Court of Appeal ruled in favor of the Church of Scientology, by acknowledging that it was "certain that the presence of Unadfi influenced the course of the trial and the content of debates ". The "Unadfi bad faith is manifest" both by first bringing Civil actions before the Court of First Instance and then by its presence in the Court of Appeal in 2011. "The arrogance of an association"
According to Eric Roux, President of the Union of Scientology churches in France, "this decision is not only highly accurate, but it has implications on several levels. First, it shows that the illegal presence of Unadfi in a lawsuit that led to the conviction of the ASES-CC distorted and polluted the debates, this posing the problem of the procedure's equity. Then it (decision) reminds Unadfi that they are not above law and marks the end of an impunity which they (Unadfi) thought they could benefit forever. Finally, this decision raises the question of public money's waste represented by the hundreds of thousands euros paid to Unadfi annually by the State. This taxpayer money can be used illegally (as here) in order to harm peaceful spiritual and religious movements, instead of being given to associations that deal with the real problems of our society. " 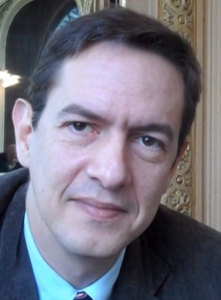 Eric Roux also notes that the Court considered that the following words were not defamatory towards Unadfi : "This application [for civil party] is the result of the arrogance of an association present at all State's levels, aware of being supported by Miviludes and the Ministry of justice, for over 13 years providing training to judges, and which all important ministries, including the Prime Minister, finance at the cost of hundreds of thousands euros. This association which in fact constitutes an administrative dismemberment of the State, demonstrates a sense of impunity that allows them to be plaintiff for thirty years without ever being recognized admissible and to continue in this way as if nothing happened. "